(Try to) take a step inside the miniature-sized Taim Falafel & Smoothie Bar and you’ll find yourself savoring the aroma and trying to hold your drool in as you look at the delicious menu. What’s even more is that Taim, pronounced tie-EEM, is affordable, healthy, and fresh! 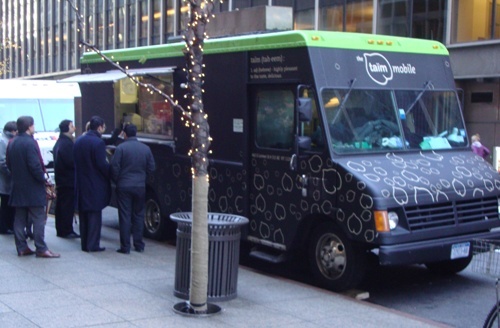 And even if you’ve never tried Middle Eastern food, you’re going to want to after reading this. If you don’t know what falafel is, don’t worry! I’ll tell ya! Falafel is a deep-fried ball or patty typically made from ground chickpeas, which means…hello, high protein! Falafel is very commonly eaten in the form of a sandwich, enclosed in a pita usually with other things like hummus, tahini, tabbouleh, Israeli salad, and pickled vegetables. And let me tell you, Taim’s falafel sandwiches are huge, affordable ($5.75) and come in three different flavors. 2. 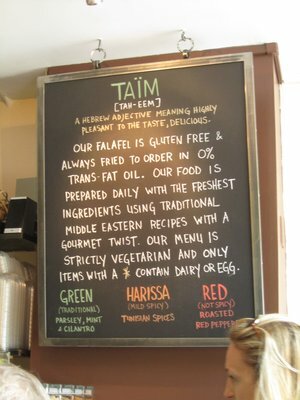 Taim is vegan and vegetarian friendly! 3. Taim’s falafel is gluten-free! 4. Taim is also Kosher. 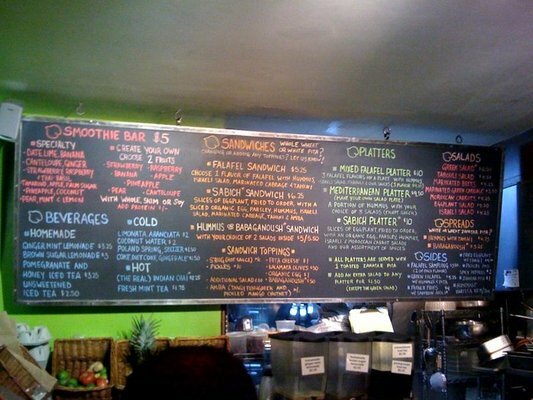 Not only is Taim known for it’s amazing, ginormous falafel sandwiches, but it also makes rich, flavorful smoothies and drinks of things you probably wouldn’t think to blend together. Taim is loved for it’s unique specialty Date-Lime-Banana smoothie, Strawberry-Raspberry-Thai Basil, Pear-Mint- Lemon smoothie, and Ginger-Mint Lemonade. If these don’t sound good to you, your tastebuds will tell you differently. 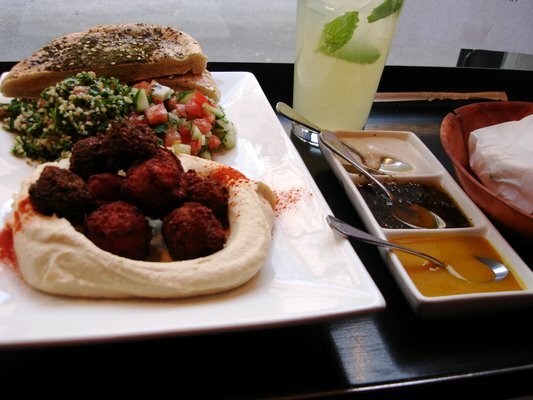 It also serves falafel platters and sides like french fries and babaganoush, an eggplant-based spread, (my favorite). Oh, how I love when the parental units come to the city. You get a free dinner, free dessert, and sometimes…free money! A few days ago, my mom’s boyfriend and one of my younger brothers met me at my new apartment. (New is a relative term; the place still needs a lot of work.) While I was unpacking the massive suitcase of clothes they brought over, the guys headed to a nearby sports bar on Hudson Street and Charles Street, Bayard’s Ale House, to watch the Jets game and eat some yummy appetizers. In my opinion, the food was good, not great. However, their chips, of “Chips and Salsa” off the Tapas menu, were some of the best tortilla chips I have ever had in my life, AND they were only $2! The guys insisted we get dessert and I spotted this gelato place I never tried before, called L’Arte del Gelato. I typically get pistachio gelato, and yes, my friends tease me because usually grandparents like that flavor. But hey, you like what you like, and pistachio is delicious! However, to my dismay, L’Arte del Gelato did not have pistachio in stock. They did have mixed berry, of which I am a HUGE fan, but then I feasted my eyes on pumpkin gelato, and so it was determined…I had to get a scoop of each. While I admit that I’m not sure how normal this combination sounds, trust me when I say that they go together very well. I highly recommend L’Arte del Gelato, and so does Yelp.. Reviews got 4.5 stars!